And so it begins. Another new year filled with promises of change, a better life and starting anew. I am as guilty as the next when it comes to pledging self-improvement and other typical resolutions. But over the past few years I have slowly come to realize that imperfection is a part of life, and some things should not be changed, only accepted. I find the whole notion of "out with the old and in with the new" increasingly alarming. As an American living in Scotland, I often find myself living between two worlds, and neither is perfect. But it does offer a unique perspective, especially where conservation, preservation and architecture are concerned. In the United Kingdom, and Europe as a whole, physical space is at a premium. To simply tear down, start anew or move further out-of-town is often not a viable option. The case remains, whether a preferred alternative or a fact of life, most Europeans have to make use of existing spaces and buildings. Of course there are benefits to new construction, one being innovations in energy efficiency. That said, when I return home to the US, which is often these days, I see a sea of sameness in the vast American master planned suburbs. Even at the risk of losing a little piece of history, most seem to holdfast to the idea of onwards and upwards. In the past few years there have been numerous depressing examples that continue to remind me that buildings and monuments are not only historically important to a region and culture, but they serve as visible symbols linking us to our past. In 2009 I was gripped by the images of La Ronda, a 1929 historic mansion in Bryn Mawr, Pennsylvania, designed by the renowned architect Addison Mizner. The fifty-one-room Mediterranean Revival and Spanish Gothic Revival structure was sold for 6 million dollars to Joseph and Sharon Kestenbaum, who in turn demolished the historic home in order to build a new 10,000-square-foot house. According the to the Philadelphia Inquirer, Joseph Kuhls, a lawyer retained by the owners, cited lack of air conditioning as one of the justifications for demolishing the historic mansion. Most recently the startling imagery featured in The Ruins of Detroit, a pictorial chronicling the visual relics of Detroit's rise as a global capital and its extraordinary plunge into ruin, has haunted my thoughts. 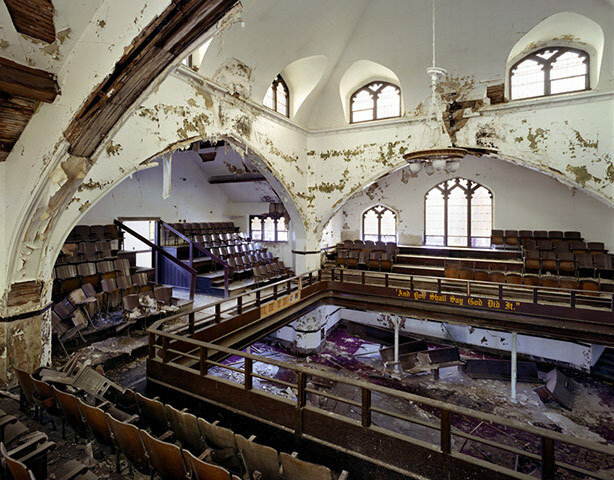 Shot by French photographers Yves Marchand and Romain Meffre, children of Paris's banlieue (the US equivalent of "the projects"), The Ruins of Detroit tells the city's story through starkly stunning photos of abandoned ballrooms, dilapidated public libraries, vacant schools, decaying houses and devastated churches. If ever the adage 'a picture is worth a thousand words' rang true, the message Marchand and Meffre convey in this soon to be released (in the US) tome is astonishing. 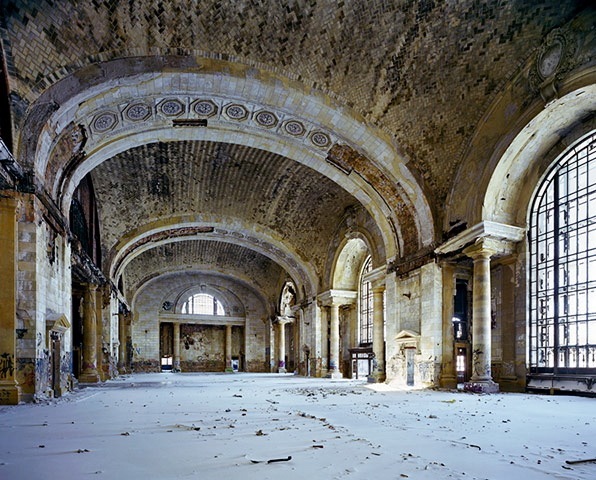 Having photographed primarily abandoned theatres, the two happened upon an image of Michigan Central train station in Detroit while surfing the Internet. "It was so stately and dramatic that we decided right then we had to go and see the building," Meffre told the Guardian. "However, we were naive and had no idea of the scale of the project, of the vastness of downtown Detroit and its ruins. There is nothing comparable in Europe." 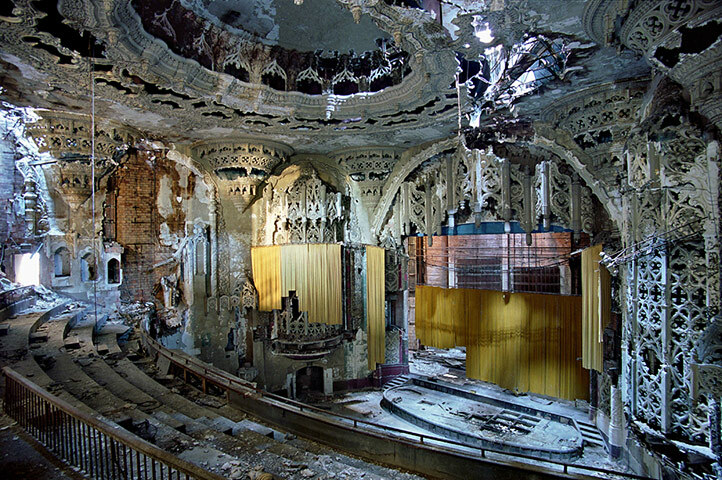 The Spanish Gothic United Artists Theater in Detroit. Built in 1928 and Closed in 1974. Their five-year collaboration began in 2005 with seven weeklong visits to Detroit. "In many ways it's as if Detroit has just been left to die. The feeling that you had entered a lost world was overwhelming, " Marchand recalls. "Many times we would enter massive art deco buildings, with once-beautiful chandeliers and extraordinary frescoes, and everything was crumbling and covered in dust." The book is both a stark reminder and a disconcerting witness to an important and once thriving city that is now sadly littered with decaying buildings. For me, even as an uninformed college student making contributions to the National Trust for Historic Preservation, I grasped the concept that in some cases, 'in with the old and out with the new' could lead to catastrophic and irreparable changes. As an adult I know now that preservation is more than just admiring beautiful architecture, it can also be environmentally responsible. Adaptive reuse of buildings not only preserves tangible links to the past, it allows us to take advantage of infrastructure that is already in place.